Again, this week we have a technology focus for our featured stories. We start with an article outlining the rapid rise of China and how it’s continuing to shape the global digital landscape. We know the country’s a global economic and geopolitical force. They’re also rapidly becoming a major player in digital technologies, both at home and around the world. In little more than a decade, China has become the largest e-commerce market in the world. China’s mobile payments for example are 11 times the value of those in the United States, as consumers’ eagerly embrace mobile technology. China is now a leader in global venture-capital investment in technologies like virtual reality, autonomous vehicles, 3-D printing, robotics, drones, and artificial intelligence. It’s this transformation that’s driving the countries push for improved productivity and international competitiveness. The ‘post-90s’ generation in China is emerging as the new engine (quite different to Western millennials) of consumption. Innovation is thriving and as a consequence, industries are now changing their business models. Further details and links to the story and associated reports are outlined below. 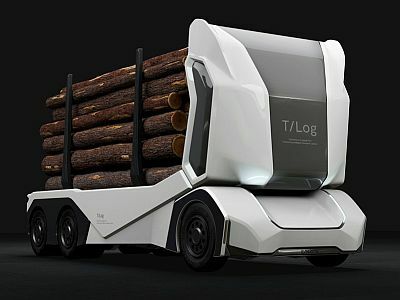 Other innovations this week include the latest offering from Swedish start-up company Einride, an all-electric autonomous log truck called T-Log that’s expected to be on the road by the end of this year, a new process that’s just been developed for printing large 3D objects using cellulose and yet another tall timber building that’s just been announced, this time a 10-storey hotel in Perth which when completed, will be one of the largest timber structures in Australia. 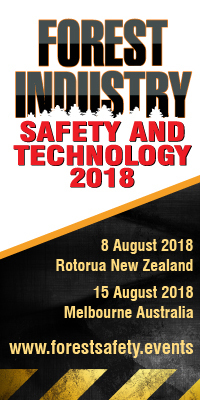 Finally, for upcoming technology events we’ve included this week details on the large number of international tech developers who’ll be travelling into this region for September's wood manufacturing series, WoodTECH 2018, information on the NZ Conference (early-bird registrations finish today) being run on engineered wood for commercial and multi-residential buildings in late August and further information on the upcoming Forestry Safety series. Also, the 15th issue of ForestTECH.news was sent out to well over 1,000 forest resource managers, remote sensing, GIS and mapping specialists and inventory foresters from throughout the region this week. If you’d like to sign up for future issues, click on the link above. That’s it for this week. Enjoy this week’s read. International technology being showcased at WoodTECH 2018 Never has the local wood manufacturing industry seen such a turnout. Leading global technology providers will be travelling into this region in September. Why? 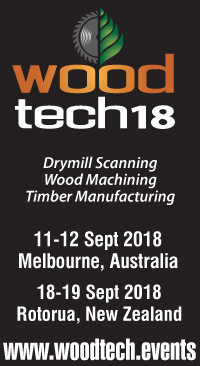 To participate in the eagerly awaited WoodTECH 2018 series. “It’s been eight long years since those involved in wood manufacturing have had an independent technology update” says Brent Apthorp, FIEA Director. “Last year, we had a record turnout to the WoodTECH series in Australasia. Well over 400 attended. It was the largest gathering yet seen of sawmilling companies, saw-doctors and sawing technology providers. The series concentrated on sawmill scanning, sawing and green-mill optimisation technologies. This year the focus is shifting to dry-mill or stand-alone wood manufacturing operations. Technologies being showcased include; robotics and automation and changes being seen in wood manufacturing, advances in wood scanning and board optimisation, finger-jointing, cross cutting and ripping, timber gluing and laminating, timber machining, kiln drying, timber finishing, material handling operations, mill maintenance, changes to timber standards, H&S and training and skills development. 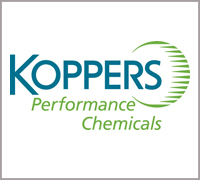 “We’re delighted to have attracted this year leading International tech providers and equipment manufacturers from around the globe” says Brent Apthorp. Outside of the Australasian expertise brought together, presenting companies include; SuitX, USA, LMI Technologies, Sweden, RemaSawco, Sweden, WoodEye, Sweden, MiCROTEC, Italy, Airstar, USA, PMP Solutions, Canada, Invictum, Slovakia, USNR, USA, Weinig Grecon, Germany, Conception, Canada and TS Manufacturing Canada. “As well as more practical sessions aimed at mill production and operational staff, we’ve this year been able to build in technologies right at forefront of scanning, optimisation and wood handling technologies” says Brent Apthorp. “We’ve been able to include advanced manufacturing technologies like robotics. Industrial exoskeletons which are being used increasingly to reduce worker fatigue in the manufacturing environment are also for the first time being introduced to local wood manufacturers. Some local companies have explored the opportunities but have as yet to learn just what the technology is, how and where is it being applied and does it have any use in wood manufacturing”. Also, in the tech space this year we’ll be covering wearable technologies that are able to harness the power of mobile connected employees on-site and the option of laser cutting of wood. Exhibitions showcasing new innovations, new products and new services likewise are a huge attraction for local companies. At last year’s event the trade show sold out well in advance of the event running. This year, the turnout is anticipated to be huge with both venues likely again to be full. The company that purchased 29,000 hectares of state-owned plantation forests has further invested in Tasmania's forestry industry, buying former Neville Smith Forest Products subsidiary SmartFibre. Reliance Forest Fibre was established two months before the plantation sale in September last year and has a parent company in the Cayman Islands. It is owned by Global Forest Partners, one of the world's largest timber investment firms. According to James Neville Smith, the former owner of SmartFibre and proponent of the Southwood Fibre woodchip export facility near Dover, SmartFibre was sold to Reliance in March. Right to information documents released last week raised questions about links between Reliance and SmartFibre after the documents revealed Reliance general manager Danny Peet emailed Sustainable Timber Tasmania (formerly Forestry Tasmania) on behalf of the Neville Smith Forest Products Southwood Fibre proposal in late May. Mr Peet was the general manager of SmartFibre, and after the company was sold became the general manager of Reliance. Mr Neville Smith said Mr Peet had been working on the Southwood Fibre woodchip export port proposal before the company changed hands, and the email was a result of Mr Peet finishing up business. Mr Neville Smith said he was personally no longer a director of SmartFibre and had no involvement in the company. He said it was an oversight that SmartFibre's website still listed him as executive chairman. Mr Peet declined to comment. Forest Industries Association of Tasmania chief executive Craig Jones said Reliance's purchase of SmartFibre would be good for Tasmania's forestry industry and would enable Reliance to begin harvesting the plantations. 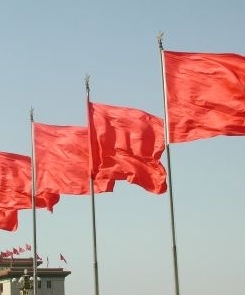 "It maintains competition in the plantations sector, particularly in that northern area," he said. "It's important in that it uses the residue from the market in that area." Mr Jones said there remained an issue with processing wood residues from plantations in southern Tasmania, which still need to be shipped up north for processing. He said the settlement of that problem with the proposed Southwood Fibre woodchip export facility near Dover would "be a good thing" if it occurred. If a tree falls in a forest and there's nobody around, does the truck that comes in to pick it up make a noise? Not much of one, if it's the latest offering from Swedish start-up Einride, an all-electric autonomous semi looking to carve out a niche in an increasingly crowded (but not yet entirely real) market. The new truck, unveiled at the Goodwood Festival of Speed in the UK, is the T- log. Like on the T-pod, the truck Einride unveiled last year, there's no cab or engine, just a skinny, sculpted, white slab up front. At the back are upright supports to hold the logs in place. Company engineers have beefed up the suspension and strengthened the chassis to cope with the heavier load and rougher forest roads that a logging truck will see. For a utility vehicle, it manages to look adorable. And like the T-pod, the T-log uses an electric drivetrain, with 300 kWh of battery capacity (equivalent to three high-end Teslas, the universal unit for electrics) and a range of 120 miles. Fleet operators are very aware of the bottom line and can be persuaded to try new technologies if there’s financial payback. When it comes to electric propulsion, Einride says removing the engine and replacing it with batteries in the vehicle bed allows a better layout for cargo and should make trucks cheaper to produce. A smaller footprint means the truck is more flexible on spaces it can reach. 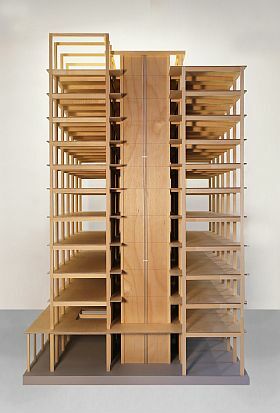 Until recently, New Zealand developers had been slow to adopt the engineered timber structures in contrast to leaders in Australia, Canada or the USA. Now, more engineers here are recognising engineered wood’s advantages with new building information modelling technology for designing commercial buildings. In August a national conference on engineered wood for commercial and multi-residential building is set to attract hundreds of early adopters as New Zealand moves fast to catch up our Australian neighbours in sustainable commercial buildings. One distinct advantage is speed. Engineered wood buildings are erected much faster than traditional poured concrete slabs and on-site welded steel columns. The key to wood’s speed and accuracy comes from using new design and manufacturing software known as “building information modelling” (BIM). Engineered wood structures are ripe for using these highly accurate systems and automated machining technologies. 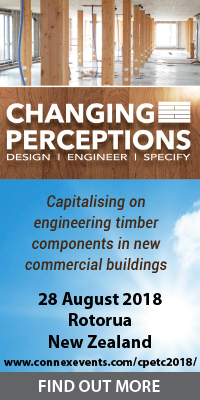 “Following trends in Australia and the USA, the use of engineered wood is growing as BIM becomes more widely used by complete project teams – from engineers and architects right through to tradies,” says John Stulen, conference director for the 3rd Annual “Changing Perceptions” engineered wood conference on sustainable commercial building. “The shorter project times have also caught the eye of all of leading trades contractors, especially when their people see BIM in action on a tall wood building project,” says Stulen. “This year we are delighted to have all 100% of our conference case studies outlining New Zealand wood projects,” he adds. This national conference has grown since 2016. It now attracts a wide audience of architects, engineers, developers, quantity surveyors and specifiers, as well as building officials and leading specialist trades, focused on commercial buildings; like electricians and plumbers and heating/ventilating/air conditioning specialist and leading practitioners. The “Changing Perceptions” Conference has full one-day programme on 28 August at the Distinction Hotel in Rotorua. The event begins with an evening reception on 27 August. Note: Early bird registration discounts end this Friday 20 July. Further information and registrations can be made on the event website. Much has been written about the rise of China as an economic and geopolitical force. Let’s break off one chunk this week: China’s role as a major player in digital technologies at home and around the world. China’s consumer economy is now among the world’s most digitized, and its business landscape is packed with start-ups and rapidly transforming business models. In little more than a decade, China has become the largest e-commerce market in the world, accounting for more than 40 percent of global e-commerce transactions. China’s mobile payments are 11 times the value of those in the United States, thanks to consumers’ early embrace of mobile technology. This flourishing digital culture is paying innovation dividends, as China is home to one in three of the world’s “unicorns,” or start- ups with more than $1 billion in market cap. And China now places in the top ranks of global venture-capital investment in virtual reality, autonomous vehicles, 3-D printing, robotics, drones, and artificial intelligence. That innovation base is birthing a host of new business models that might soon revitalise other, previously lagging sectors of China’s economy. According to a recent report from the McKinsey Global Institute, these new approaches include directly linking business buyers and suppliers in disintermediation plays (Alibaba and others) and disaggregating incumbent value chains as digital attackers move in. What might be next? Creative destruction on a grand scale, which could ratchet up productivity and the international competitiveness of China’s economy. By 2030, 10 to 45 percent of revenue in China’s industries could shift from old business models to new, digitally enabled ones. The transformation is picking up steam: in 2013, industries in the United States were 4.9 times more digitised than those in China; in 2016, that figure had fallen to 3.7 times. Look for China to continue shaping the global digital landscape and supporting and inspiring entrepreneurship far beyond its own borders. Forestry slash is under the spotlight in Hawke’s Bay, as damaging floods increase in both frequency and scale. The issue has been highlighted at a national level, with devastating flooding and damage in Hastings and Gisborne making national news. In Hastings there have been two heavy floods leading to evacuations this year, while in Tolaga Bay, north of Gisborne, serious flooding in March last year and in June this year left properties wrecked and people homeless. In all cases, forestry debris was believed to have been a major factor. Across Hawke’s Bay there are steep areas of forestry that have residents and councillors concerned, particularly in the hills around Waimarama, on hill country back towards the Kaweka Range, and on the steep slopes of Wairoa. Hastings District councillors George Lyons and Tania Kerr are working with Hawke’s Bay Regional Council on the issue – looking for the gaps in regulatory oversight and on-the-ground management that will reduce the risk. “In Hastings, already this year we have had two 50-year flood events, and forestry slash has been a problem in both. This is a concern to anyone and everyone who lives on flood plains or near rivers, particularly in those areas downstream from forestry,” said Mrs Kerr. The regional council does have a new tool; a new National Environment Standard (NES) for forestry which came into effect on May 1. That requires forestry companies to provide council with a harvest management plan, which gives the council the opportunity to regulate and monitor how slash is dealt with. “It is ironic that 30 years ago the issue was silt coming down the hills into the waterways during heavy rain events, and so there was a big push on planting pine trees over pretty much every square inch to help protect against erosion. Now we have a different issue to deal with, compounded by violent storms with ferocious rainfalls. “I do believe that with the best endeavours of all involved we will come up with solutions. Those options will include making sure we have comprehensive plans for dealing with slash – and we have the new NES to help with that – and planting buffers of permanent thick native bush between the pine forests and the waterways. Effectively that would act as a natural slash catcher as a back-up to removing everything that we can. “The forestry industry does not like this damage any more than the rest of us and they are taking it very seriously. We have had good working relationships over the last 20 or 30 years and we just have to continue working together to address this issue”. Mrs Kerr said Hastings District Council would be supporting and encouraging all those involved to come up with solutions. The work includes making use of investigations in other regions. Gisborne District Council carried out an investigation after the 2017 Cyclone Cook flood, particularly looking at the impact of forest slash. The executive summary said about 70 per cent of the wood debris was pine. Of that, three-quarters was assessed as cut logs, with a minority of that assessed as stored logs ready for market. The balance was old weathered logs. It said that while some areas had “slash catchers”, these “can be ineffective . . . [by being] over-topped or bypassed”. The responsibility for forestry sits with both regional council and district council. The planting of forestry is managed under the Hastings District Council District Plan, as are resource consents for earthworks, forestry roads and on-the-ground operational facilities. Regional council manages the flow-on effects, such as slash washing into waterways and onto beaches. Australia and New Zealand are closer to developing a joint trans-Tasman standard for forest management following a joint meeting recently between the boards of Responsible Wood and the New Zealand Forest certification Association (NZFCA) in Wellington. Responsible Wood and the NZFCA operate PEFC-endorsed sustainable forest management systems in Australia and New Zealand respectively. A significant outcome of the meeting between Responsible Wood and the New Zealand Forest Certification Association will be the development going forward of a joint Australia-New Zealand standard for Sustainable Forest Management AS/NZS 4708. “We are confident of getting the right structures in place for the development of a joint standard recognised in both countries,” Responsible Wood CEO Simon Dorries said. The New Zealand Forest Certification Association is primarily concerned with forest-related certification activities and is the governing body in New Zealand for the global forest certification scheme PEFC. Wood Processors and Manufacturers Association of NZ CEO Dr Jon Tanner Chief Executive said after the meeting his board was looking forward to developing the joint standard, which had been given the green light by Standards New Zealand. “The process will probably kick off at the end of the year,” he said. Standards New Zealand attended the meeting and provided useful feedback and guidance on the joint initiative. Standards New Zealand is a business unit within the Ministry of Business, Innovation and Employment and is New Zealand’s leading developer of standards and standards-based solutions, developed in partnership with Standards Australia. During the meeting, the Responsible Wood board visited the Masterton plywood and LVL operations of Juken New Zealand, 100 km northeast of Wellington. JNL operates four wood processing mills employing nearly 900 people and manufactures advanced and innovative wood products from selectively-planted, managed and harvested radiata pine sourced from plantation forests in the Northland, East Coast and Wairarapa regions of the North Island. The New Zealand forest and wood products sector relies heavily on exports with around 70% of production going offshore. Increasingly, the main markets, particularly Australia, North America and Asia, are demanding third-party certification as proof of legality of harvest and quality of forest management. Most of the countries New Zealand exports to are now PEFC members and recognise PEFC certification as meeting their import requirements. Researchers from the Singapore University of Technology and Design (SUTD) have developed a technique for printing large 3D objects using cellulose, one of the main components in wood. They believe it will revolutionize manufacturing - providing a cheap, renewable, and biodegradable alternative to plastic and creating conditions for a circular economy. The SUTD team combined cellulose with chitin, a polymer found in the cell walls of fungi. By introducing controlled amounts of chitin between cellulose fibres, researchers managed to trigger a fungal-like development, making the materials stronger and easier to work with. The material can be processed in the same ways as wood: including drilling, sawing, and sanding. No organic solvents are used in the process, making production of the material - which researchers call FLAM (Fungal-like adhesive material) - completely ecologically sustainable and repeatable in any laboratory. Furthermore, the material is producible at scale. FLAM does not require any involvement with plastics and costs 10 times less than the common filaments for 3D printing, such as polylactic acid, according to the researchers. 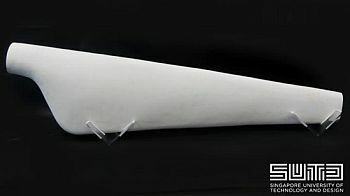 Researchers demonstrated the new material by 3D printing a 4-foot-long turbine blade and a chair. According to SUTD Assistant Professor Javier Fernandez, FLAM production is "probably one of the most successful technological achievements in the field of bio-inspired materials to date." Western Australia is joining the timber trend sweeping the eastern seaboard with its first timber-framed building, a 10-storey hotel at inner city Northbridge. 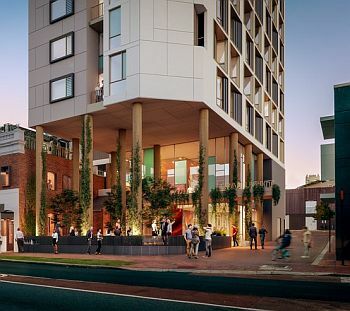 The AU$14 million “Leadlight” hotel on the corner of Beaufort and Newcastle streets being developed by Adam Zorzi and Rod Hamersley’s Australian Development Capital has got the green light to build what will be one of the largest timber structures in Australia. The building’s proponents, including Perth-based Klopper and Davis architects and Hera Engineering, landed on the use of lightweight mass timber to allow the tower to be built above the usual three-storey height restriction. That timber framing is significantly lighter than concrete and steel framing is not the only reason the material was selected, Klopper and Davis’ director Sam Klopper told The Fifth Estate. Mr Klopper said that building sustainably is a primary focus for the Perth-based architects, who are looking for opportunities to appeal to the “noisey” green building market. As well as using locally-sourced timber – a hybrid of cross-laminated timber (CLT) and laminated veneer lumber – other sustainability features of the Leadlight plans include targeting a 5-star Green Star rating, and leveraging natural ventilation and lighting, where possible. Mr Klopper also said that the hotel operators hope to attract a “young, edgy crowd” as their core client base, who are likely to have an interest in sustainable design. He said that although much of the timber frame is concealed by cement sheeted cladding for fire-proofing reasons, some sections will be exposed to ensure the building’s green credentials don’t go unnoticed. Using timber is not yet an inexpensive way to build, said Mr Klopper, but the design choice is intended to generate savings in the long run. 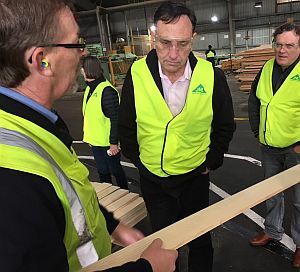 The cost of building engineered timber structures is likely to drop as the market matures in WA, which may take time due to the local construction industry’s close affinity with brick, he said. Klopper and Davis have already been involved in the plans for a timber-framed social housing demonstration project in Perth’s Wellard in collaboration with Peet Limited and the Department of Communities. Included in the demo project are 16 apartments over four storeys. The project is intended to demonstrate that timber can be used as an alternative to masonry construction, particularly for medium-sized buildings. In early August a major national forest safety conference – FIEA's Forest Safety & Technology 2018 Conference – will show how well forest workers have embraced new techniques for integrated workplace safety. “The engagement with loggers and tree-planters by Fiona Ewing’s team at the Forest Industry Safety Council (FISC) has been outstanding,” says Forest Industry Engineering Association (FIEA) spokesman, Gordon Thomson. “In planning our case studies for this year’s conference, we found plenty of examples of people taking the things that FISC have been promoting and putting them into practice,” he adds. “One of our keynote speakers – Hillary Bennett has been working with people in industry and FISC for a long time. Her principles and techniques have been well accepted both here in New Zealand and in Australia among leading forest managers and contracting people,” adds Thomson. - Hillary Bennett, Director, Leading Safety: Creating a positive safety culture is recognised as an essential part of effective health and safety management. Conversations are at the heart of a strong health and safety culture; not only are they a way to convey commitment and caring for others, they are also a powerful way to understand, and improve, everyday health and safety outcomes. But how conversations are had can determine if they are effective. Speaking up isn’t always easy, but it’s crucial. Participating in a facilitated conversation means people can honestly reflect their views. - John Tidswell – Business Development Manager, The Drug Detection Agency: John will discuss key issues in workplace impairment testing, legislative obligations, recent trends in testing statistics, overseas trends, oral fluid testing and finally; how marijuana legalisation might affect our industry. - Rahul Watson Govindan , Group CEO, Thundermaps: Protecting distributed teams through hazard awareness: Tech capabilities has advanced rapidly in recent years. 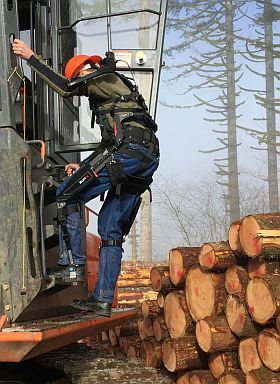 The forestry industry is unique in the challenges it faces, with distributed teams in dangerous environments. By using data we can mitigate the risks employees face. The data often exists, the challenge is to get it in front of people when they need it. Specific hazard details for forestry are crucial. With people out in uncertain and changing environments outside of a company’s immediate control, awareness of various and ever-changing hazards is crucial. These systems has been applied for OSPRI – with people on large farms across the country. The NZIF Foundation has announced education and research awards totalling $41,000. “For this year’s allocation of funds, we were excited to have more awards, receive more applications and announce a record level for distributions”, said Dr Andrew McEwen, the Foundation’s chair. The awards were announced at the New Zealand Institute of Forestry Conference dinner in Nelson. Trevor Best, a PhD student at the University of Canterbury School of Forestry received a $10,000 Future Forest Scholarship for his research on the way machine operators in the logging industry deal with stress within their work-life with an emphasis on the implications for their health and safety. Leo Mercer, a PhD student in environmental studies at Victoria University of Wellington received a $10,000 Future Forest Scholarship for his research examining the role native forest restoration, in association with carbon farming, can play in the development of Māori land on the East Coast of the North Island. Mat Curry, a Forestry Science student at Canterbury University received the $5,000 NZ Redwood Company Scholarship. Logan Robertson, a Forestry Science student at Canterbury University received the $5,000 Invercargill City Forests award, which is available to assist residents of Invercargill City in studies, research or travel in an area benefiting forestry. The Jon Dey Memorial Award assists research projects in the areas of work study or new technology aimed at improving forest engineering and harvest productivity. $3,500 was awarded to Cameron Leslie, for his Master’s project on the productivity of winch-assisted machines. The Otago/Southland Award of $3,000 went to Rhys Black, a University of Canterbury student for his analysis of the availability of bulk vessels for log exports, using data from South Port and Port Otago. The Frank Hutchinson Postgraduate Scholarship of $1,000 went to Yannina Whiteley at Canterbury, the University Undergraduate Scholarship of $1,000 was awarded to Phoebe Milne, a first-year forestry student at Canterbury and the Mary Sutherland Scholarship of $1,000. was awarded to Georgia Paulson, who is in her second year of the Level 6 Diploma in Forest Management at Toi-Ohomai, in Rotorua. Three forestry students from Canterbury University received prizes in the student poster competition at the NZIF Conference. Ben Reriti received first prize of $800, Millan Visser second prize of $500 and Lauchie Weston third prize of $200. A new forestry training scheme which will enable youth to earn while they learn has been launched in Northland, New Zealand. The scheme could be the answer to the shortage of forestry workers and youth unemployment in the region. Associate Minister of Forestry Meka Whaitiri formally launched Tupu Ake, which could be replicated in other parts of Northland. This innovative project sees industry, training providers and iwi coming together to provide a new pathway into trades training. Tupu Ake aims to improve training and increase the number of youth in the forestry industry where currently there is a shortage of skilled workers. Led by Forest Protection Services the programme offers 15-24 year-olds keen on working in the forestry industry the chance to gain tertiary qualifications, life skills, and, at the end of the 12 month programme full time employment. FPS has partnered with Te Matarau Trust who will provide the life skills and pastoral support component of the programme and Northtec who will provide the classroom element to develop the technical skills. Three of the five days is spent working in the forest. "This transitional care is very important to the success of the programme," says FPS managing director Kevin Ihaka. The students are paid a full-time youth weekly wages by FPS”. Ihaka says this gives the trainees not only enough money to support themselves, but once they are productive they can achieve extra pay incentives. "Some of the issues the industry faces is high turnover - we want to show them (the trainees) the diverse career opportunities within the industry, the good working conditions and great team environment - so we can keep then and help them get focussed towards a proper pathway." The personal development and training days are funded by the Ministry of Business Innovation and Employment through He Poutama Rangatahi a pilot initiative focused on tackling youth unemployment. Qualifications gained through the Tupu Ake programme includes; a New Zealand Certificate in Forest Industry Foundation Skills (Silviculture Lvl2), a New Zealand Certificate in Forest Operations (Pruning Level 3), First Aid Training, a class1 driving licence and Health and Safety Training. Four applicants had enough skills to be fast tracked into full time employment while ten trainees have already started the programme. A further 20 will join in 2019. Thomas Maness, dean of the College of Forestry at Oregon State University since 2012, died Thursday in Corvallis following a 2 1/2-year battle with an undisclosed illness. He was 63. Many of us involved in forestry and wood products in this region over the years would have met and come into contact with Thomas. He was very supportive of our early efforts when the first wood manufacturing tech programmes into New Zealand and Australia. In those days, 20 years ago or so, manufacturing expertise was non-existent in this part of the world. Many of the earlier independent experts bought out to assist local wood producers were sourced directly from Thomas. We wish his family and OSU colleagues the very best. Under Maness’ leadership, OSU was ranked the second-best college of forestry in the world in 2017 by the Center for World University Rankings, behind only the Swedish University of Agricultural Sciences in Uppsala, Sweden. The College of Forestry is currently undergoing a massive restoration with the $79.5 million Oregon Forest Science Complex, which is anticipated to open next spring. The 95,000-square-foot project will include the new George W. Peavy Forest Science Center, A.A. “Red” Emmerson Advanced Wood Products Laboratory and Richardson Hall. Before joining OSU, Maness spent a decade in private industry as a research engineer, and in 1994 he founded the Canadian National Centre of Excellence in Advancing Wood Processing at the University of British Columbia in Vancouver, Canada. Working closely with industry, he led research in sawmill optimization and real-time quality control systems. 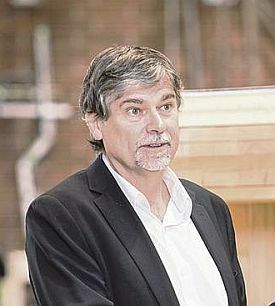 He also founded the British Columbia Forum on Forest Economics and Policy a decade later, guiding research in forest policy and sustainability. The world lost more than one football pitch of forest every second in 2017, according to new data from a global satellite survey, adding up to an area equivalent to the whole of Italy over the year. The scale of tree destruction, much of it done illegally, poses a grave threat to tackling both climate change and the massive global decline in wildlife. The loss in 2017 recorded by Global Forest Watch was 29.4m hectares, the second highest recorded since the monitoring began in 2001. The new data is based on 30m resolution satellite data and records all forest loss, including that from forest fires. Human destruction causes virtually all deforestation in the tropics, a vast haven of both carbon and wildlife. Fires are dominant at higher latitudes, causing roughly two-thirds of losses in Russia and Canada, and may be becoming more common due to climate change. New forests are being grown, in China and India for example, but the precise extent to which these offset the destruction of existing ones is not yet known, although it is clear that deforestation significantly exceeds afforestation. It is estimated that only about 15% of the forests likely to have existed before human civilisation remain intact today: a quarter have been razed and the rest fragmented or degraded. More >>. I can't remember if we've run this one before or not. If we have, just blame it on old age. A group of chaps, all aged 40, discussed where they should meet for lunch. Finally it was agreed that they would meet at Wetherspoons in Uxbridge because the waitresses were good lookers and wore mini-skirts.